The West of England Combined Authority will work with colleges, councils and businesses to help the construction industry fill the estimated 82,500 jobs that will be created by 2036. West of England Mayor, Tim Bowles, will launch a new report into the construction sector today (October 31), on a visit to Bath College’s new Somer Construction Centre in Radstock. He said: “We were the first region to commission an in-depth look at skills needs of this sector and it shows that construction is a vital contributor to our economy. With 668 projects in the pipeline, valued in excess of £12.6bn, it’s clear that there are huge opportunities here. “We will use the evidence this new report gives us to inform joint working with local colleges, councils and businesses to ensure that as a region we continue to provide the right skills to sustain the industry. The purpose-built facility at Bath College’s Somer Valley Campus, Westfield, was built with £2.73 million funding from the West of England Combined Authority and Local Enterprise Partnership and opened in September. New workshops are being used by 500 students and apprentices studying bricklaying, construction, carpentry and stonemasonry, as well as plumbing, electrical installation and refrigeration. Bath College Principal, Laurel Penrose, said: “We’re proud of this new building, which is a fantastic facility and will allow students to get the very best out of their time studying with us. • In 2017 alone, forecasts suggest over 33,000 people are employed on construction projects valued at £1.14bn in the West of England region, dominated by new housing (33%), commercial developments (30%) and infrastructure (27%) spend. • The greatest demand for workers is likely to be among wood trades, electrical, plumbers and bricklayers, with more immediate needs for floorers and logistics staff. The research was put together by the Construction Industry Training Board (CITB) which is developing a strategy and action plan to help take advantage of the opportunities in the industry. 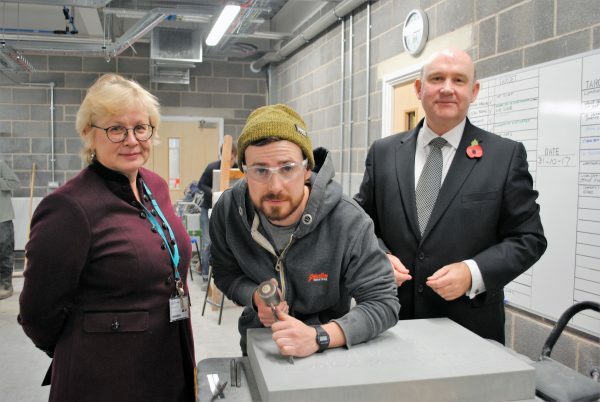 Image: Bath College Principal Laurel Penrose, Level 3 stonemasonry student Jonny Stoker and West of England Mayor Tim Bowles.